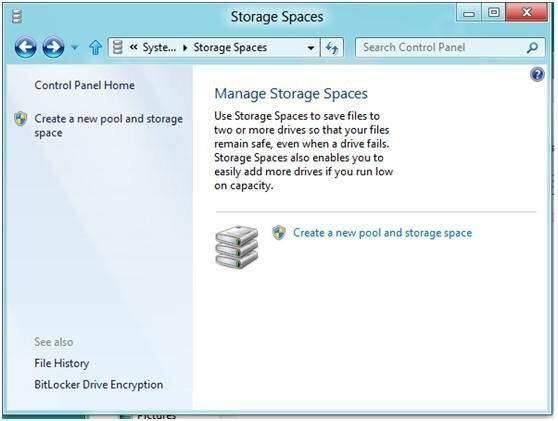 How to Create Storage Spaces in Windows 8? Windows 8 storage spaces provides a solution for users to use multiple hard drives in a RAID-like way. In this article, we will show you how to create storage space in Windows 8. In consideration of users’ increasing need of larger capacity hard drive, better security of data storage, Microsoft has unveiled a RAID-like new feature in Windows 8----Storage Spaces. It allows the users to group multiple hard drives together in storage pool. 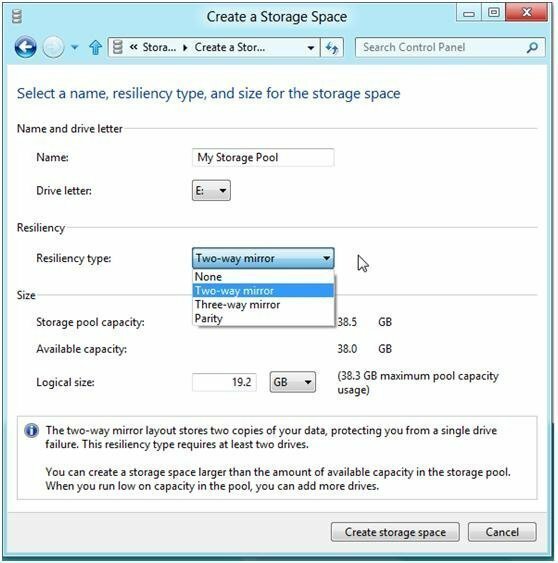 Then use the pool capacity to create a Storage Spaces. By simply extending the number of hard drives and combining these drives (the port can be SATA, USB, SAS etc.) into a virtual hard drive, we can make the Storage Space larger, more flexible and more efficient. Basically speaking, the usage of virtual disk (Storage Spaces) is almost the same as the usage of physical disk. But virtual disk (Storage Spaces) is the superior one with a new advantage: thin provisioning. Storage Spaces is not a function that designed for replacing the special solutions such as RAID. But it does offer us many functions that meet our core needs. Storage spaces can improve the performance of Windows storage platform that’s based on NTFS. Storage Spaces is a good assistant for us to deal with a variety of situations, it can be used in PC or the data center for enterprises. In Windows 8 developer preview, the storage of Storage Spaces is limited to 2TB. Later in Windows 8 Beta, the limitation has been canceled. How to Create a Storage Space? 2. Select the hard drives that you want to add into the Storage Spaces. Please be careful here because the files on these hard drives will be cleared after the operation. Make sure to back up the important files first. 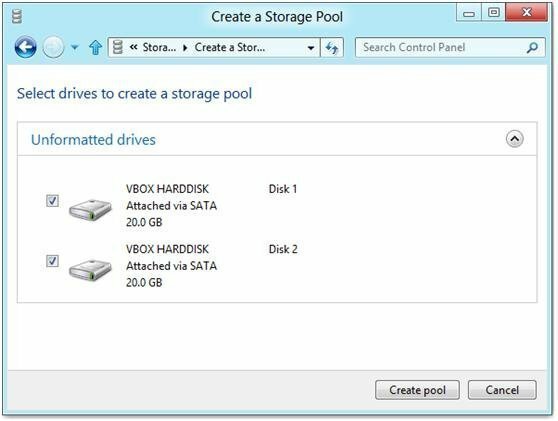 When the disks are selected, click on Create pool to continue. 3. In this step, we’ll be asked to name the storage pool and give it a drive letter. For resilience type, it’ll decide the way how Windows recognize and process the data. None: If one hard drive of the Storage Spaces fails, the data will be lost because there’s only one copy of the data in this type. Two-way mirror: Two copies of data will be created in this case. One hard drive fails won’t lead to data loss. Three-way mirror: Like two-way mirror, three-way mirror will have three copies of data store in storage pool. Therefore, no data loss will occur though one or two hard drive fails. Parity: In this way, Windows will store parity data. It’s a more efficient way than mirroring. However, it has a slower reading speed. All in all, parity is especially useful for large size files. When all the setting is done, click Create Storage Space to start the process.